Buddhist figure at Darawat [temple], Gya. bl.uk > Online Gallery Home	> Online exhibitions	> Asia, Pacific and Africa Collections	> Buddhist figure at Darawat [temple], Gya. Taken by Thomas Fraser Peppé in 1870 this photograph is part of the collection of Sir Richard Carnac Temple. 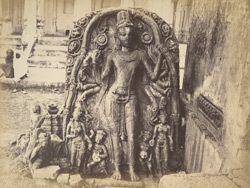 This view shows a Buddhist sculpture from Dharawat in the Bihar District. The surrounding hills are full of places of archaeological interest and many Buddhist remains have been found here.